Encryption is the process of converting data into a format that cannot be read by others. Microsoft provide EFS feature (Encrypting File System) to encrypt your data when it is stored on the hard disk as part of professional versions of Windows. This encryption is tied to operating system and a file encrypted with EFS can not be opened on another computer than the one who encrypted the file. In the case of a major crash requiring formatting and reinstalling the operating system, all data is lost. It will be impossible to recover the data. It is not possible to use EFS to protect data on external hard disk or USB disk. 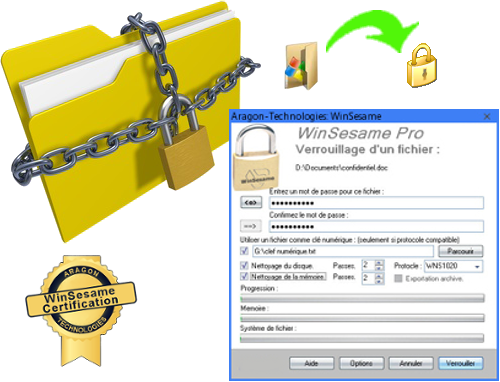 It is impossible to send an EFS encrypted files as attachments with an email. In case of computer theft the only protection is the password windows logon. Generally users do not feel very concerned about the security of this password. Users will rarely change the password. This password is usually not a good level of security. File backups encrypted EFS will not encrypted. Encryption is independent of the operating system. If you format your computer you simply need to remember passwords used to protect your data. You do not lose any data. You can protect your data on the hard drive of your computer or external hard drives, USB drives, network, and even send protected files by email. 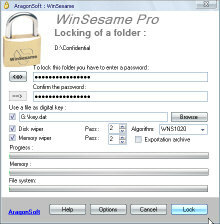 In case of theft of your computer, the thief can not open your files protected even if he finds your password logon Windows. 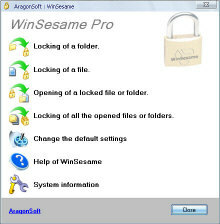 If you backup files protected by WinSesame, it remains encrypted in your backup. You no longer fear the theft of your backups. From the main select Locking of a file. Browse the disk for the file you want to encrypt. Enter and confirm the password of your choice to protect this document (the length is not limited). If the document has already been locked the password associated with it will be recalled automatically to eliminate any risk of error. The icon of the file is changed to indicate that this file is encrypted. To open this file, double click on the icon, enter the password. The file opens. By using the closure of all protected files opened from the main menu or the shortcut installed on your desktop. You can lock all the files you opened during your Windows session.